A playground climbing wall makes a brilliant addition to any play space. 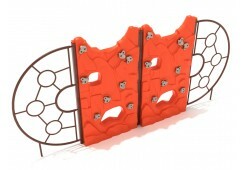 The design of a playground rock wall makes it a piece that continually challenges climbers of all ages. Both young and older climbers benefit from the exercise that this type of equipment offers. Motor-skill development, building lean muscle, weight loss, and even problem-solving from figuring out how to progress up the wall are all benefits of this activity. Help visitors to your park or playground gain all of these benefits and have fun, too, with a playground rock-climbing wall from PlaygroundEquipment.com! As the popularity of rock-climbing as a hobby continues to grow, this equipment will only become more popular with the kids who visit your play space. 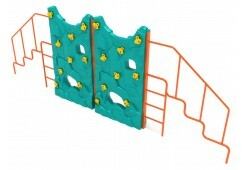 Buy a playground climbing wall online to let children hone their climbing skills in a safe way! Kids who want to climb do well with adult supervision by people who know something about kids climbing. Before taking on the challenges of actual rock-climbing, kids might want to start by mastering more regularly shaped climbing equipment. That’s because these pieces allow children to use appropriately sized spaces for hand and foot placement, and the edges are smooth, so they won’t cut themselves. They can also learn to recognize the placement patterns of the holes, which helps them learn planning skills. Once they master this sort of climbing, they can graduate to the craggy play structures we have for sale here. To set up a rock-climbing playground, first, determine how many playground climbing walls the space needs. In a popular area, it makes sense to have several pieces for climbers of different sizes and capabilities. Whatever your needs might be, PlaygroundEquipment.com can help. We can offer advice on which pieces of commercial play equipment would be best for your space and what would make the best playground rock wall setting. And once you place your order, you’ll get your items fast: We pride ourselves on quick delivery. Reach out today and begin the ascent to purchasing one of these fun, sturdy walls. We’ll make sure that outfitting your play space isn’t an uphill battle!